First thing you need to understand is that computer (Machine) can only understand Machine language (Stream of 0s and 1s). In order to convert your C program source code to Machine code, you need to compile it. Compiler is the one, which converts source code to Machine code. In simple words you can say that a compiler converts human readable code to a machine readable format. Step 1: Locate the TC.exe file and open it. You will find it at location C:\TC\BIN\. Step 3: Save the program using F2 (OR file > Save), remember the extension should be “.c”. In the below screenshot I have given the name as helloworld.c. Step 4: Compile the program using Alt + F9 OR Compile > Compile (as shown in the below screenshot). Step 5: Press Ctrl + F9 to Run (or select Run > Run in menu bar ) the C program. Step 6: Alt+F5 to view the output of the program at the output screen. The generated file would be helloworld.exe if you are compiling on windows. Once you give the above command, a .exe file would have been created if you are on windows then type the following command to run the source code. gcc compiler took the human readable format (helloworld.c file) and converted into a machine code for Windows, Linux and Mac OS X. 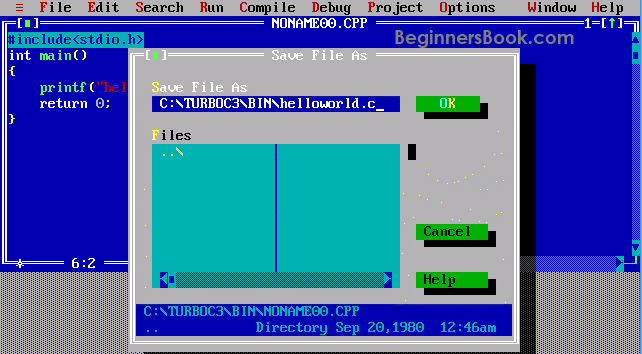 This is very simple tutorial that anyone can get basic idea related to “turbo c”. So thank you very much for your valuable service. Thank you very much for posting these things.The beginners get a good idea about turbo compiler. I WANT TO KNEW HOW TO CONVERT C++ FILE INTO EXE.